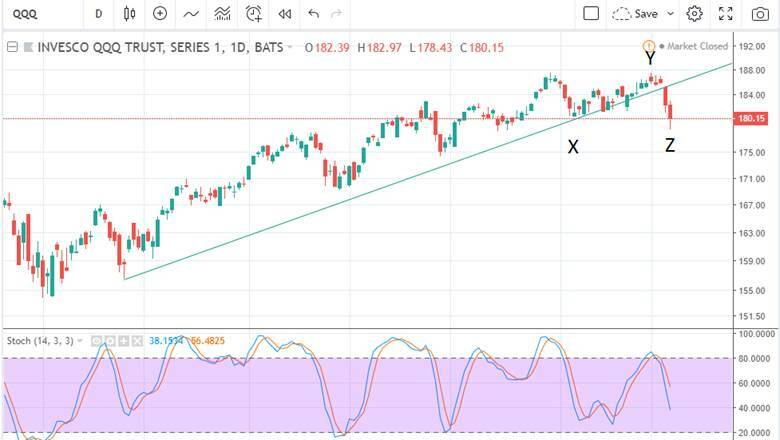 Stock Market Sell Off, Dollar Rally Expected, Now What? This has been a most difficult stock and precious metals market to forecast. I am fortunate to have made my clients over 18% the past 6 weeks. Yesterday, I went to cash after having cashed my volatility (UVXY), short GDX (DUST) and short SPX (SPXS) ETF. The VIX futures went into backwardation Friday, and the last two times this occurred was February 2, 2018 and August 21, 2016. The next trading day took the SPX down about 4% on each occasion. We have had horrible internals and the momentum indicators have not confirmed the recent topping action, so anything is possible. 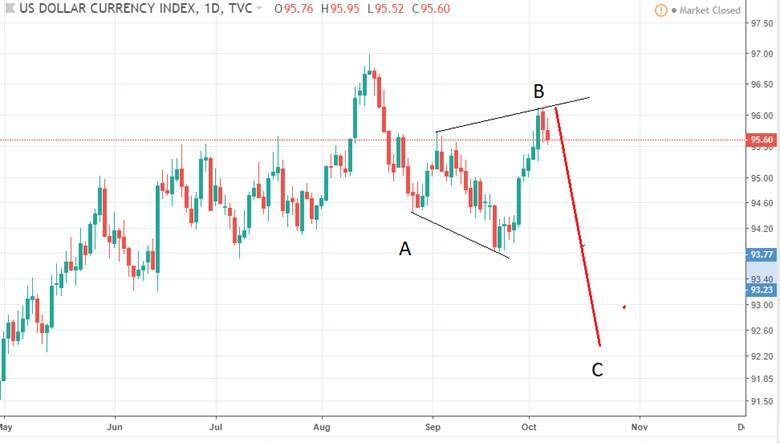 Normally, coming off a top, there is a period of sideways congestion called a bear flag before such a move like what the backwardation is suggesting happens. If sell-off is to be the case, I think it would be obvious enough to join the party on Monday to the short side. The actual 8 TD low is due on Monday plus or minus, so we’ll see. The QQQ (NASDAQ 100) looks like it is near a Z wave bottom and that is usually bullish, so we have conflicting signals. The SPX has a low due around Oct 17 and the SPX chart supports a move to near 2791/92 by that date. 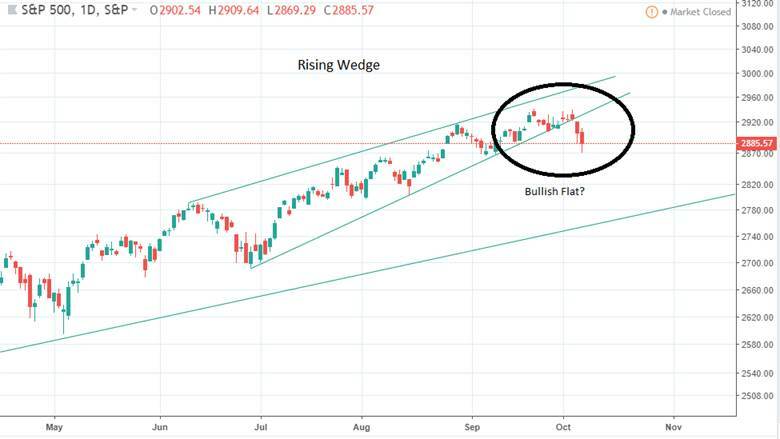 Normally, when a rising wedge is broken, there is a snap back to the wedge and sometimes inside the wedge before it drops further. We have not seen that yet. The 8 TD top off the 16 TD top on the SPX came right on time for the SPX on Wednesday. The next 16 TD top is due Oct 15. Do we rally from Monday or Tuesday next week until the 15th? Do we rally to new highs? Even with all the bearish leanings, this market has a way of slapping the heck out of the bears. This is why I’ve been quick to take profits on my shorts, even sometimes a little early. The dollar rallied like I thought, so I give myself an A for that forecast. The metals stayed strong during the rally, which I thought could go either way. Actually, this is a strong sign that the metals are about to enjoy the next phase of the rally. My best guess is 20.50-21.00 on GDX for the next phase, which could take place by around Oct 18th. The cycle analysis suggests a top in early November. 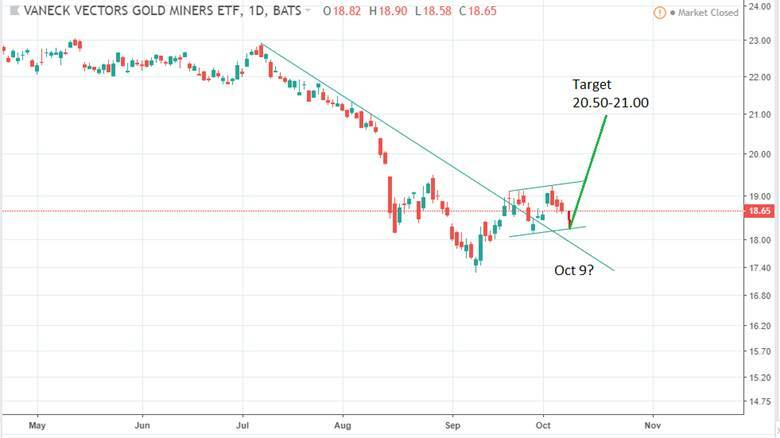 GDX looks like it could go down into the 9th and there is a Bradley turn due on October 9th also. It remains to be seen. My longer term forecast suggests new highs ahead into next year, at least into mid year and a possible 20% pull back into October 2019. If we get this pull back, we may get a delay of the coming great reset until 2021-23/24. It looks like a 90%+ crash is possible.